The Suwung landfill in South Denpasar is not the only place burning in Bali at the moment. A forest fire broke out on the slopes of Bali’s Mount Agung on Thursday. Wooded areas around Daya and Kubu have been observed smoking, however, this fire’s not an easy one to put out. The burn area lies inside steep terrain of the eruption hazard zone of Mount Agung, which persists at level III “standby” status for an eruption. There continues to be an exclusion zone recommended by Indonesia’s volcanology center, encompassing a four-kilometer radius from the volcano crater, which has been extended and reduced back down to four kilometers a number of times since the Bali volcano rumbled back to life last year. Outside of this exclusion zone, Bali remains safe and tourists are urged by the government to still come for holiday. Head of the Karangasem Fire Department I Nyoman Sutirtayasa said that his department has been coordinating with officers from East Bali Forest Protection Management (RPH) to put out the fire at an altitude of about 1,500 meters above sea level. “Officers from East Bali RPH are conducting fire monitoring at monitoring posts,” Sutirtayasa told Bali Post on Thursday. The officers are ready to start fighting the fire if it spreads further down outside of the exclusion zone, but at the moment the terrain is to challenging to access the burn location, according to the fire department head. “The route to the (fire) location is difficult. The effort that can be done now is to prevent the spread of the fire to the lower slopes. If we go up, we do not dare enter the danger zone,” Sutirtayasa told Tribun Bali. “The area of land burning is getting wider. The fire has reached the south of Mount Agung and has spread to forested land above Pajenengan Temple, Pempatan Village. The cause of the fire is still unknown,” Sutirtayasa said. Meanwhile, Made Warta, head of the East Bali Forest Management Unit says that his officers have been working with local residents to try and contain the downward spread of the fire. They also dare not risk entering the danger zone, but they have been extinguishing flames trying to come down the mountain. There are three apparent hotspots that have appeared and the burn area is estimated to be about a hectare, Warta told Tribun. There isn’t even a hiking trail to one of the areas, Warta explained of the difficult access. Hot weather and strong winds have been contributing factors in allowing the fire to spread and flare up. The post Forest fire breaks out on slopes of Bali’s Mount Agung appeared first on Coconuts. PONTIANAK, Indonesia (AP) – Police in the Indonesian part of Borneo island have arrested more than a dozen people suspected of starting forest fires that have killed four people in the past month. West Kalimantan police chief Didi Haryono said yesterday that two of the 27 people wanted by police died in blazes they started to clear land for planting. He said 14 people have been arrested so far. They could be prosecuted under an environmental protection law that allows a maximum 10-year prison sentence for setting fires to clear land. The national disaster agency says four people have died in West Kalimantan’s forest fires in the past month, including two suspects. Millions of hectares burned in Indonesia during annual dry season fires in 2015 that spread a health-damaging haze across the region for weeks. The disaster, estimated by the World Bank to have caused losses of USD16 billion, was exacerbated by the practice of draining swampy peatland forests for industrial plantations, making them highly combustible. Indonesia’s government imposed a moratorium on peatland development in 2016 but has made little progress with plans to restore such wetlands to their original condition. 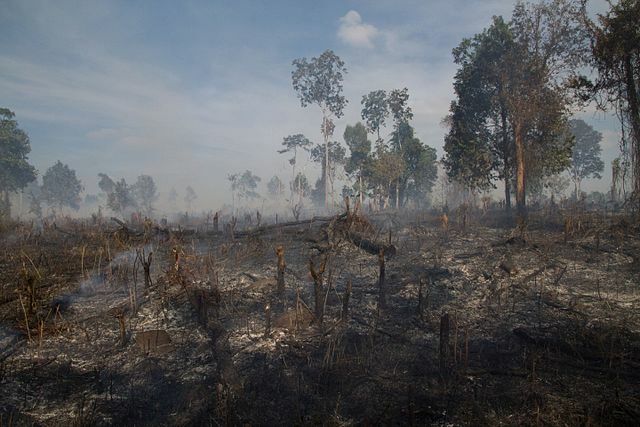 Officials said the recent haze in West Kalimantan has diminished due to fire-fighting efforts. Sahat Irawan Manik, an official with a local fire unit, said on Monday that conditions had especially improved in the provincial capital, Pontianak, and around the airport. “There are still some fires in five districts but there are water bombing teams by the Disaster Mitigation Agency, which has deployed 10 helicopters to help extinguish the fires,” Manik said. About 1,000 hectares of fires have been extinguished across the province, he said. Raffles B. Panjaitan, director of investigation and forest protection at the Ministry of Environment and Forestry, said the number of “hotspots” in West Kalimantan had dropped to 21 on Monday from 60 on Sunday. Panjaitan said that so far this year, 71,959 hectares of land have burned in forest fires compared with 165,464 hectares from January to July last year.